5110 Illawarra Highway "Laurel View"
Maugers Meats is an iconic family-owned butchery business which is famous for producing its own grass-fed beef and lamb on the family farm in picturesque Robertson. Participate in a true paddock-to-plate experience, with John and Vicki Mauger as your hosts. 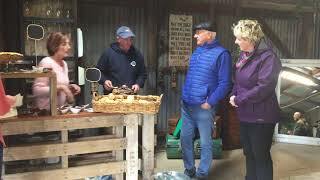 The tour includes: a farm tour with John Mauger, “Meet the Mob”; presentation on grass-fed beef and lamb production; on-farm meat tasting with Vicki Mauger; tour of Maugers' historic Burrawang butcher shop and "Art of Butchery" beef boning demonstration. The tour runs for three hours and includes morning tea and a light lunch. Remember to bring your camera to take advantage of the breathtaking views over the rolling hills of Robertson and Kangaloon.